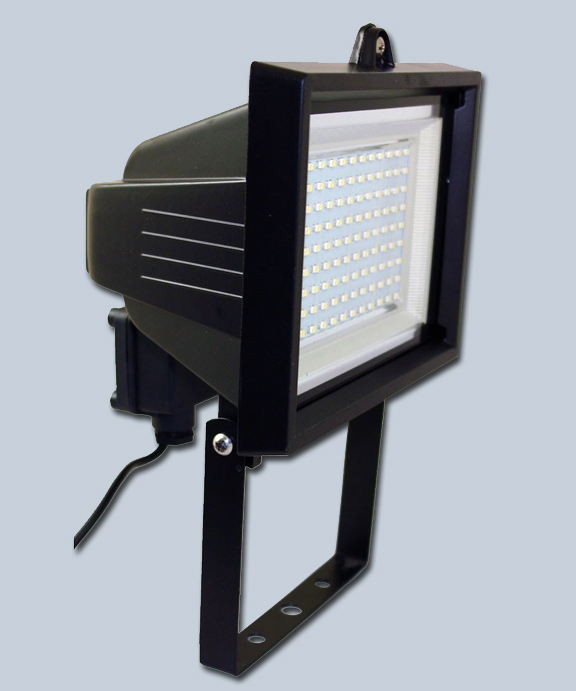 Our 108 SMD LED Flood Light with RF Remote Control is a commercial grade solar flood light with 108 state-of-the-art SMD LEDs for continuous illumination that is up to 17% brighter than traditional LEDS while using dramatically less energy for longer operating times. Perfect for areas with high demand flood light requirements, it provides strong light covering areas approximately 30 feet wide by 30 feet deep. A Radio Frequency (RF) Remote Control can control the flood light from up to 60 feet away from the fixture: including from indoors. Providing continuous, not motion-activated, illumination, it’s recommended for lighting signage, recreational areas, parking lots, driveways, continuous security lighting, ground lighting, or to create dramatic building up-lighting. Set the light to automatically turn on at dusk and run for 10 to 12 hours or dawn (whichever comes first) with a master On/Off Switch located on the light switch. Both the solar panel and solar flood light can be installed via ground staking using including hardware, ideal for up lighting walls, signs, structures. The ground stakes can be removed for flat mount operation on walls, wide posts and other flat mount installations. 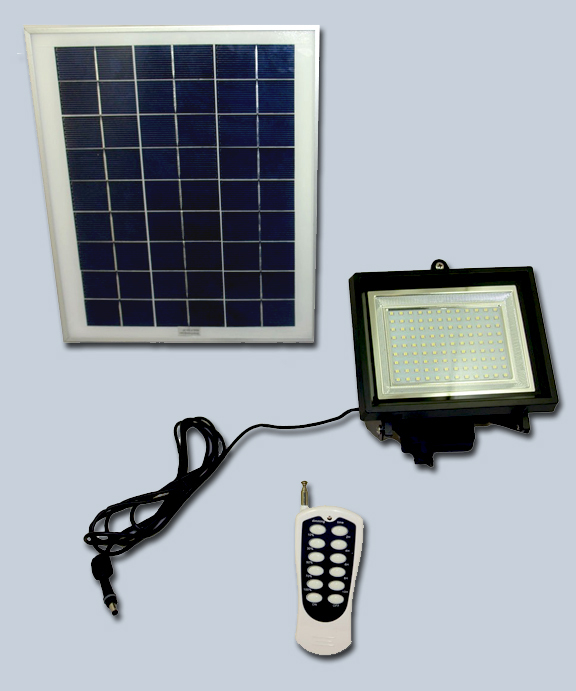 A nine-foot cord between the solar panel and the fixture lets you place the floodlight where light is required and the solar panel in a sunnier location. Extra 9.8 foot cords are available as an option. 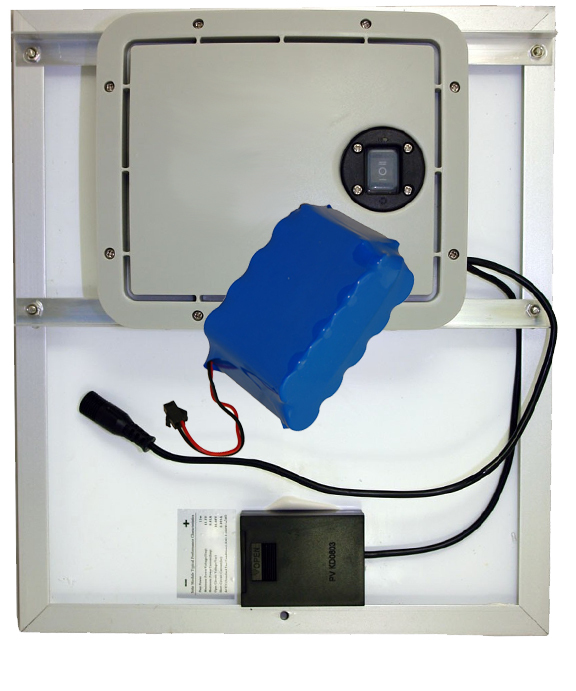 *Depending on environment at installation site (geographic location/latitude, temperatures and average daily sunlight) estimated operating time is 10-12 hours on a fully charged battery. A fully charged battery requires 6 hour of direct sunlight.